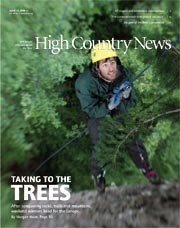 After conquering rocks, trails and mountains, weekend warriors have found a new hobby: Climbing the West’s big trees. Kate Krautkramer ponders the ramifications when her 7-year-old son abruptly tells his best friend that he doesn’t believe in God. Rick Bass’ memoir, Why I Came West, describes how his 20-year struggle to save Montana’s Yaak Valley held him hostage, preventing him from concentrating on writing the short fiction that he loves. Rhonda Claridge describes a hard winter in the high mountains and points out that one seldom-acknowledged effect of climate change could be harder winters in some parts of the world. No smoking onstage in Colorado; a really rotten trick; wheat field in the Big Apple; it’s hard to charge a dead man with a crime; Brian Schweitzer and Montana just say no to Homeland Security. Washington’s cougar population is in serious trouble, and some trace recent problems back to a 1996 ban on hunting the big cats with hounds. Despite a cold winter, the West is still warming; the Southern Nevada Water Authority has wild ideas about water; renewable energy is on a roll, but expensive Western resorts are not; neglected Forest Service roads make a mess in the Pacific Northwest.